I mentioned previously that I recently upgraded my VMware environment from 4.0 to 4.1. 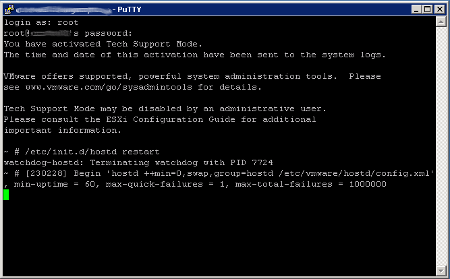 One of the cool things that using ESXi 4.1 over ESX 4.0 is that it's easier to enable remote tech support mode. If you don't know what that means, it basically means enabling SSH access to your ESXi server. In ESXi 4.0, in order to enable SSH you had to log into tech support mode from the console, then using VI edit the /etc/inetd.conf. In 4.1, you can just enable it through the administration console. "Remote Tech Support Mode (SSH) for the host <hostname> has been enabled"
And you will see a yellow exclaimation point on your ESXi hosts in your cluster. If you are like me, you only want to see warnings like that when there is actually something wrong. It turns out this little message goes away after a reboot, but who the hell can afford to reboot anything? Most of the time, we can't right? At least not during business hours, and if you want to do it after business hours you get an earfull from the wife for working too much. Am I right? It turns out that you don't have to reboot to make the message go away though. After that, the message will go away, and you can use SSH on your ESXi servers without hassel. Esxi 4.1.0 slic bios modify.